For years I've been familiar with C. Hope Clark as the woman behind Funds for Writers, a wonderful online resource for writers. 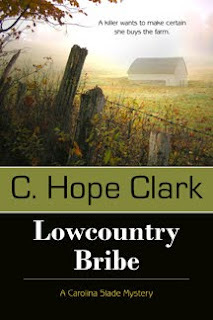 So when I heard that Hope was releasing her first fiction book, the mystery Lowcountry Bribe, I was like the overeager student raising my hand and shouting "Ooh, ooh! I want to interview her!" For years I'd thought of Hope as a nonficiton writer and here she was with not one, but an entire series of fiction books. The idea of writing a series has always frightened me . . . how can authors come up with enough ideas all taking place in the same world, do their characters ever bore them? 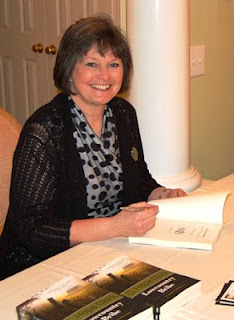 Thanks to Hope for answering those questions and more about her Carolina Slade Mystery series. WOW: Hope, you just released your first mystery Lowcountry Bribe and are busy on your next mystery in the Carolina Slade series. The idea that the same world must fascinate readers for not just one book but a series is an intimidating idea (at least for me). How did you ensure that Carolina, a newly divorced loan officer for the agricultural community, has a rich enough life that you could draw on it for several books? HOPE: Jodi, that is the least of my problems, believe me. I worked for USDA in a job very parallel to Carolina Slade's role. I married a man who was a federal agent for USDA. We met on a bribe. Lowcountry Bribe is fiction, but the catalyst was real. In real life, I did minor investigations and my husband did major ones. We have a deep well of ideas to draw from as well as a rich setting in the rural reaches of South Carolina. I would write these stories until the day they sprinkle my ashes, because the ideas number that many. Actually, I've already written the next two books and started research on the fourth. The rural South is alive with stories, no less than urban settings, plus I believe the characters have more depth, involved in events and drama that spin differently than in the city. South Carolina abounds in history, and its residents are pretty dynamic souls. We're known for stirring a lot of controversy, to include starting a few skirmishes or two, and I intend to tap that strength, or foible, depending on how you view it. It's amazing the crime that happens in the name of the stereotypical, laid-back world of rural Americana agriculture, and I enjoy bringing it out in print. WOW: You're already knee deep in this series! Will Carolina stay in Charleston or find herself in a new setting--perhaps Atlanta or Hilton Head visiting one of the characters introduced in Lowcountry Bribe? Or will you be developing any of the secondary characters to introduce new adventures for Carolina? Her father seems like he should be the star of one of the books! HOPE: Don't you love her father? He's her hero. Yes, Slade (remember, only her parents call her Carolina) will actually graduate in her profession, drawn into the state capital as the authorities realize her talents are best utilized across the entire state, not just Charleston County. Frankly, I could find a lot of stories in that county, but I want people to know more about South Carolina, so I've set each book in a different region of the state. Always in the country. And yes, the secondary characters change. Each book will not only introduce someone new, but will bring a past secondary character to the forefront. For instance, we'll see more of Savannah Conroy in book two, as well as meet a gentleman that all my critiquers thus far seem to love as much as Wayne Largo. And what's NOT to love about Wayne? Of course the kids, Zack and Ivy, make appearances in each and every book, usually in a small family mystery of their own. I love book two more than Lowcountry Bribe, mainly due to the characters. I believe we see more of the good stuff while being entertained with new personalities that test Slade on many levels. WOW: So many mysteries revolve around a murder. Yours switched it up a bit by revolving around a bribery. Will Carolina be tripping over any dead bodies or will you continue to get her involved in non-murderous mysteries? HOPE: You'll see more than enough bodies in the next book, believe me. But the main crime that draws Slade in, once again, is not murder. Lowcountry Bribe was centered around a bribe. The next story kicks off with fraud and possible embezzlement. But as in Lowcountry Bribe, people die. It just happens. And as always, Slade seems to get in the middle of something she doesn't expect. WOW: Can't wait! You mentioned that the idea for the original book came from being offered a bribe. Did you wonder if the people involved in that incident would recognize it in your book? Will any more of your personal experiences find there way into Slade's life? HOPE: I worked diligently to alter the dynamics, setting and characters of the story so that people wouldn't see themselves. The bribe is a near reality, but the events that spun off from that initial chapter are not like what took place. The actual bribe wasn't nearly as exciting. The last thing I wanted to do is embarrass anyone, though, so I was very careful. However, a few USDA employees bought a handful of the books to check it out. I chuckled at hearing from them. Not sure you could say that entire cases become parallel cases in my books, though. I might take an encounter from one case in my life and insert it into an entirely different type of case in the book. I recall instances of conflict in dealing with controversial clients and weave them into other types of scenes. As any writer, I use what I know, pulling from personal emotions, conflict, reactions and successes. WOW: A writer once told me that with books you start out with an idea then just write and write, often with the ending changing along the way--except when you write mystery. Then you have to know the ending first, that you need that ending to be able to throw in the clues and foreshadowing throughout the book. So what do you say . . . did you know the ending from word one or did you just write and see where the characters took you? HOPE: I never know the ending, and I've read that same line of logic and disagree. However, while I come up with a story premise, a setting, and a secondary story involving Slade's personal life, I do not see the ending. As I write the books, I outline 3-5 chapters at a time, then flesh them out. Nine times out of ten, the story shifts enough to make me glad I did not outline more than those 3-5 chapters. Editing is what helps me include the foreshadowing and red herrings. But I do "what if"s like crazy on those 3-5 chapters, and it isn't until I'm writing the details do I see the best "what if" to follow. I love my endings turning into surprises. It keeps my writing exciting and fresh for me, and I think those feelings melt into the words! WOW: What's the most fun about writing mysteries? What's the most difficult aspect? HOPE: The most fun is editing them, to me. I abhor first drafts. Editing gives them life, depth and substance. I edit my stories many times, each time adding an additional layer of complexity, color, and humor. Editing inserts timing. Dialogue has to flow right. Hints have to fall in place without screaming "clue." One can never accomplish that the first time around, so the editing process is so much fun for me as I get to graduate from the equivalent of a pencil sketch, to the full palette of colors and textures that make a story experience genuine. The most difficult aspect is the first chapter and last chapter composition. I want that opening to grab and the ending to wrap up perfectly for the reader. Again, it's timing, particularly about keeping out back story and avoiding long-winded explanation in the opening. For the ending, it's about making sure all the loose ends are tied off nicely, coming full circle. I get furious when a book I've invested time reading, doesn't complete me with the ending. WOW: Very few authors have told me they love editing! Like Slade, you're a very unique character! Can you give us any hints about the next Carolina Slade book? HOPE: Assuming the editors don't alter it too much, the next book takes place in Beaufort County, SC, specifically St Helena Island. Wayne becomes more special while introducing us to a few new characters. We enjoy a lot more sass from Savvy. Slade is new in her role of Special Projects Representative, which is a fancy name for minor investigations specialist. She continues to fight the balance of when to stick her nose in and when to turn things over to Wayne, and we continue to love her for that quirky trait of hers to get involved. Tomatoes, migrants, fraud, shrimp boats, murder and deep dark water are all I'll say for now. I love this part of SC, and I hope I do it justice. Many readers of Lowcountry Bribe have begged me to finalize the sequel. The book is written. It's just a matter of the process coming together with Bell Bridge Books, a publisher I'm thoroughly in love with. But unlike some writers who tire of a series, I could live in Slade's world forever. It's just that much fun. WOW: As a mystery lover I'd like to continue to have fun with you and your South Carolina world for many pages to come! Oh! I can't wait to read this! Great interview. Thanks for that wonderful interview. I think it's the best yet! You did Lowcountry Bribe justice, and I appreciate it. Time to Spring Clean Your Writing!